I'm always looking for new ways to use up bits of our spreads. I'll experiment with stir-fry, sandwiches, grilled cheese, and appetizer recipes. 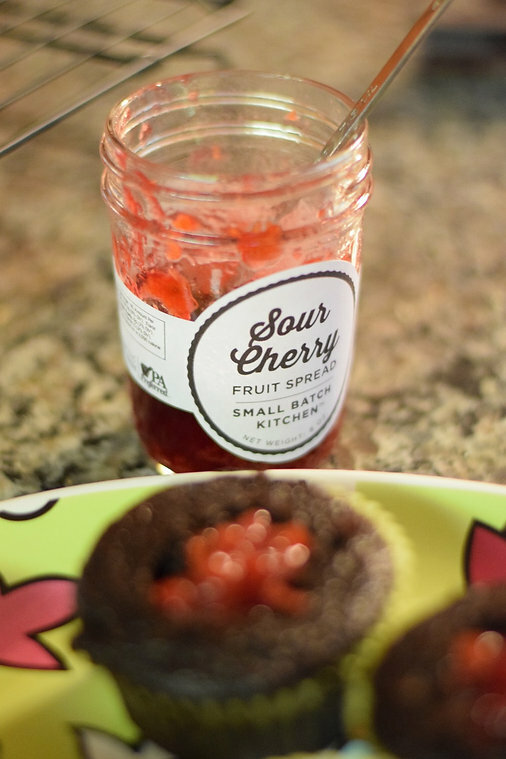 This time, I had some Sour Cherry Spread that I needed to use up. We were having a party, so I thought it would be perfect to experiment with a cupcake. My dad's favorite cake is Black Forest, so I used that as inspiration for this AMAZING cupcake. Our go-to chocolate cake recipe is called "Black Magic Chocolate Cake". I don't know where it first came from, but I got it from my mother-in-law. Detailed recipes for the cake and frosting will be at the bottom of this page. 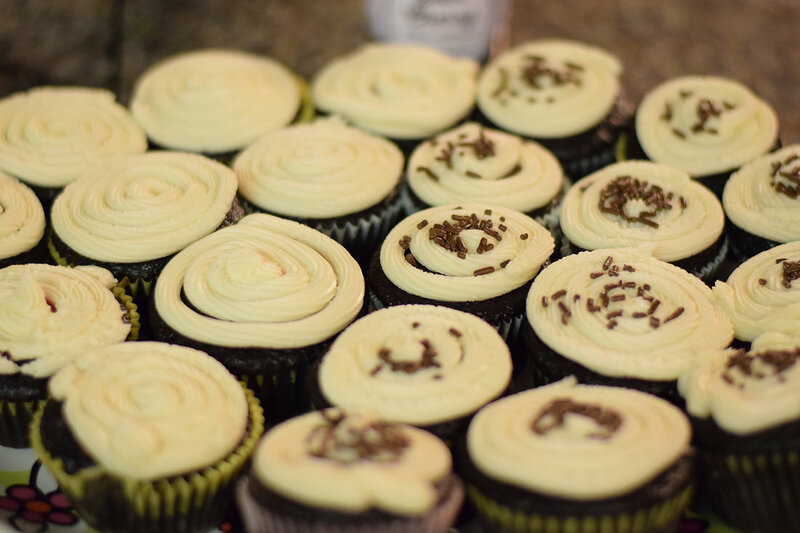 Note: The chocolate cake recipe made 30 cupcakes, and an 8 oz jar of spread fills about 20-24 cupcakes. When I made this recipe, I filled half with the spread and left the other half plain. 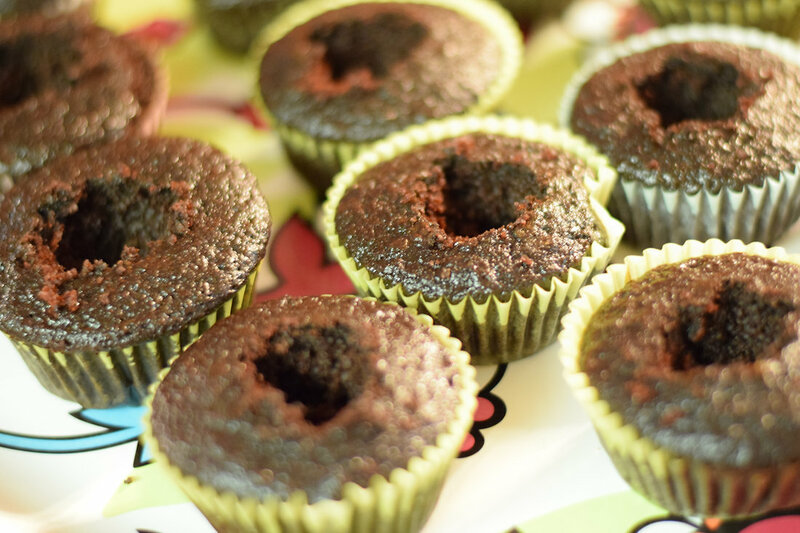 Take completely cooled cupcakes and cut a hole in the center of the cupcake. Fill hole with about 2 teaspoons of spread. 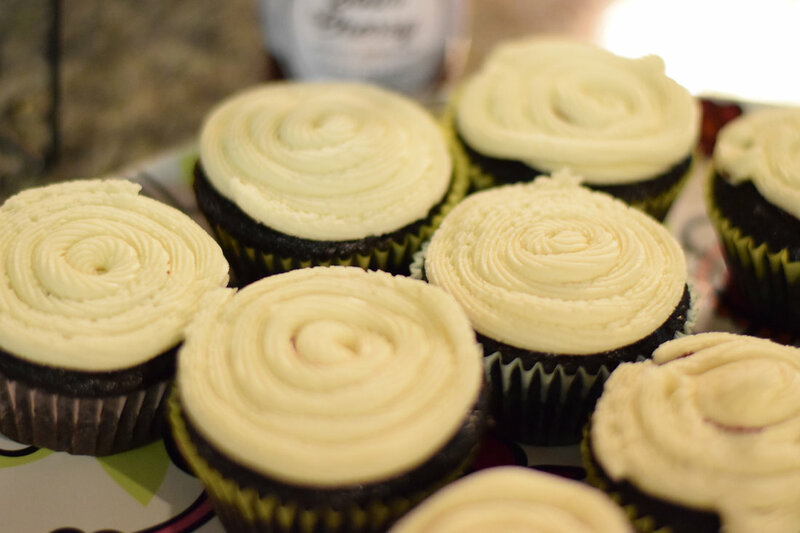 Put buttercream frosting in a piping bag fitted with a coupler and tip of choice. Top cupcake with frosting. 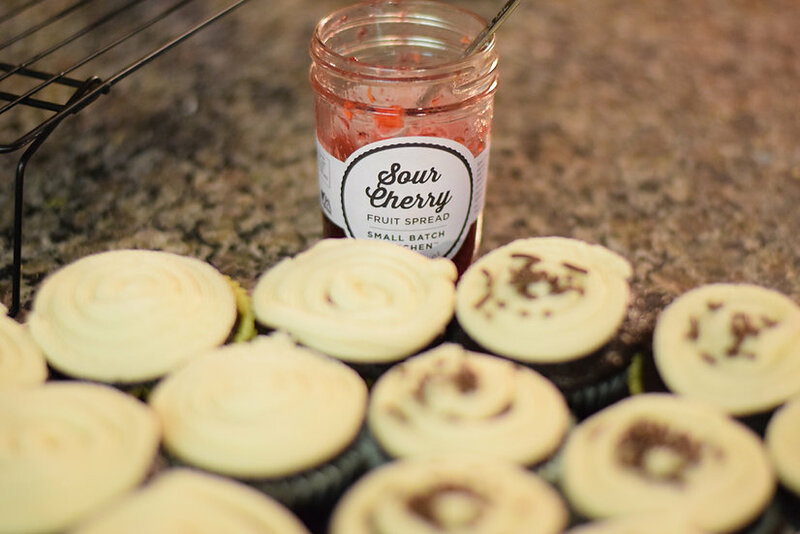 (Frosting may seem stiff, but will heat up in your hands as you are frosting the cupcakes. Add Sprinkles (if desired). I added sprinkles to the cupcakes I kept plain to tell the difference between the two flavors at our party. In a large bowl; combine flour, sugar, cocoa, baking soda, baking powder, and salt. Make a well in the center. Add eggs, coffee, buttermilk, oil, and vanilla. Beat for 2 minutes on medium speed. BATTER WILL BE THIN. 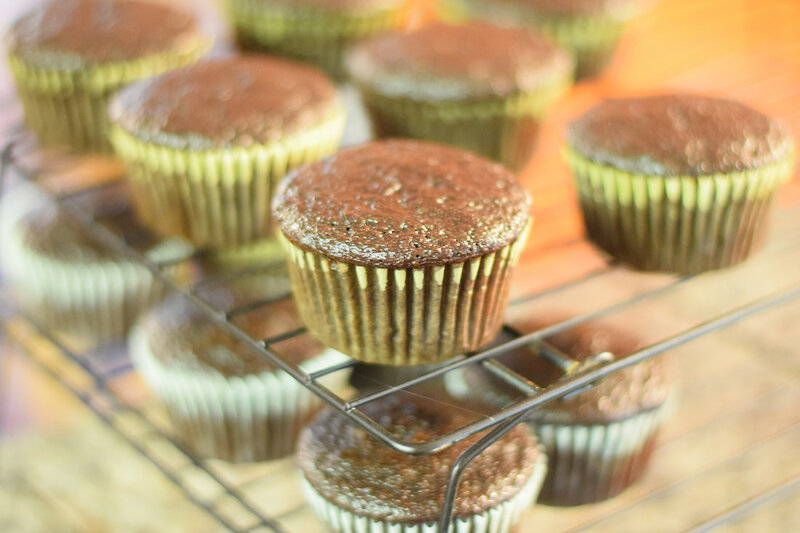 Fill each cupcake paper about half full with the batter. This recipe made 30 cupcakes for me. 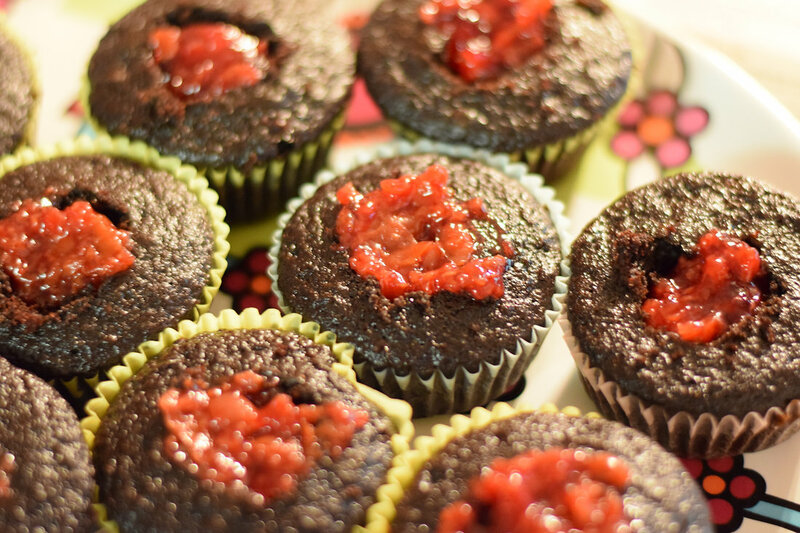 Bake at 350 F for 15-20 minutes, or until a toothpick inserted into center of a cupcake comes out clean. In a standing mixer, fitted with a whisk, mix together sugar and butter. Mix on low until well blended, then increase to medium speed and beat for another few minutes. Add vanilla and milk and continue to beat on medium until well mixed. If frosting is too thin, add more sugar. If frosting is too stiff, add more milk.